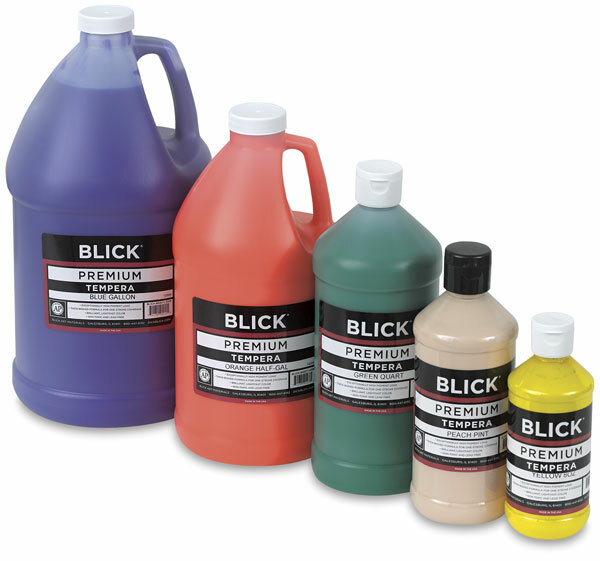 Blick Premium Grade Tempera is Blick's top-of-the-line tempera paint. It's thicker, with a consistent viscosity that stirs easily, then "bodies up" to its original viscosity. 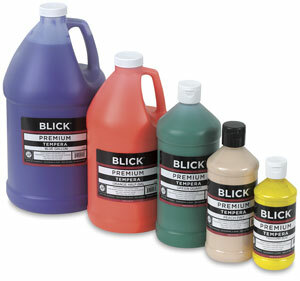 It flows more easily than Blick's Student Grade tempera, yet is still sag-free and drip-free when applied to paper. It contains a high concentration of high-quality pigments, has high color strength, is lightfast, and it won't flake, chip, or crack. It washes up with soap and water and is freeze-thaw stable. Choose from a variety of brilliant, blendable colors, including six fluorescent shades. For basic color-mixing, we recommend that you use Turquoise, Magenta, and Yellow. Lockable pump lids for gallons and half-gallons are sold separately. Formulated with safety in mind, Blick Premium Grade Tempera is non-toxic and contains no latex, dairy, casein, soy, egg, gluten, peanuts, or tree nuts. It is made in the USA. Note — Some colors may appear thin and milky. Shake bottles thoroughly before use to increase the thickness and viscosity of the paint. Set of 6 Jars — A set of 6 basic colors in ¾ oz (22 ml) jars: Red, Yellow, Blue, Green, Black, and White. Pack of Pints/ 6 Fluorescent Colors — Fluorescent Blue, Fluorescent Green, Fluorescent Pink, Fluorescent Red, Fluorescent Yellow, and Fluorescent Yellow-Orange. 4-Color Pump Kits — Our 4-color Primary Set contains one gallon each of Red, Yellow, Blue, and White. The Secondary Set contains one gallon each of Green, Orange, Brown and Black. Four lockable pump lids and 100 Stancups are included with each set. 6-Color Pump Kits — Our 6-color kits are available with gallons or ½ gallons, and contain one of each color: Red, Yellow, Blue, Green, Black, and White. Six lockable pump lids and 100 Stancups are included with each set. Pack of Pints/ 6 Basic Colors — Red, Yellow, Blue, Green, Black, and White.